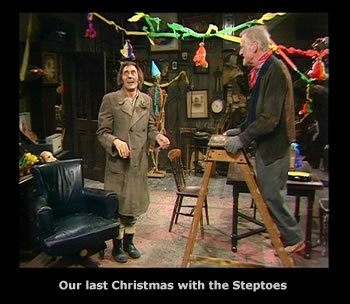 As you all know this was the last Steptoe & Son episode and I feel it wrapped the series up very well, with Albert revealing the business was actually ran by his mother not his father and most important of all Harold getting one over on his dad for once by tricking him to go on his holiday on his own, to leave Harold to be without his dad for the very first christmas of his life. I feel this episode of good will rounds up the entire series nicely. This is one of the first episodes i ever saw, it is a very funny episode especially when it is revealed that albert is illegitimate! Apparently one of the biggest laughs from the studio audience comes when Harold says the" famous people don't give up their christmases to entertain us -all those programmes are recorded in october" , as this one was!! !